This is such a fun project, no really! This post is sponsored by Home Depot, all opinions are my own. Learn how to make a charred wood tabletop for your own table. 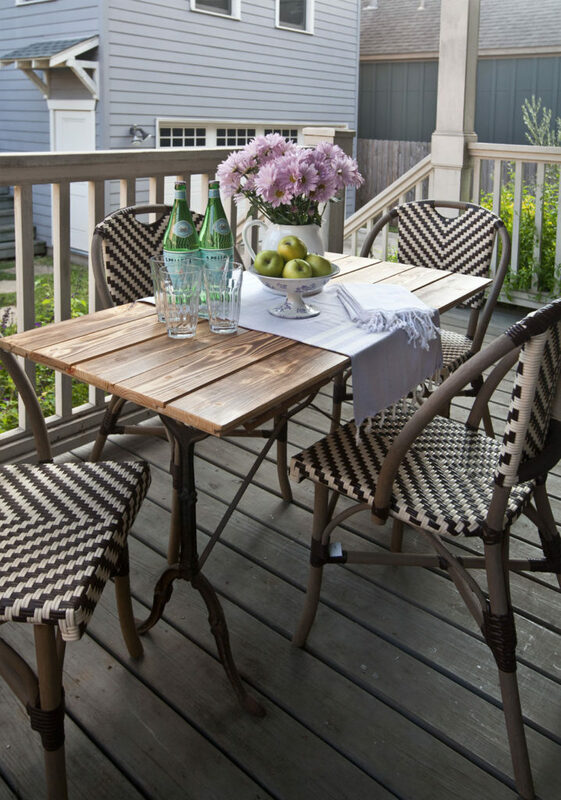 We love hanging out on our porch, and it’s so wonderful to have a table top that holds up to the weather and looks gorgeous. Here’s a look at the finished product after we finished the job. I was so excited to have the charred wood tabletop for our porch. The old tabletop was not holding up to the elements. Below you can see that the fancy crackle finish I used was not doing so well outdoors exposed to moisture. It had peeled away in places. It was time for a change. I’ve very pleased with how the project turned out. I don’t use our power tools very often, so I don’t do anything that’s too complicated. This was so simple. For complete instructions, click on the full tutorial on the HOME DEPOT BLOG, CLICK HERE. The boards I used are the charred wood boards. I ordered them online from Home Depot, and they came right to my front door. Free shipping is available for orders over a certain amount. The wood grain is so nice. 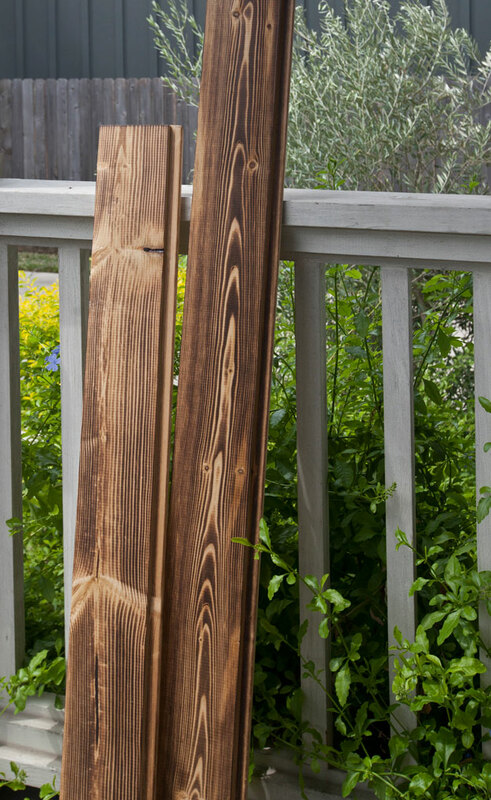 You can use these boards not just for a table top, but also they can be used like shiplap on your walls. I made the table about a month ago, and it’s been on my porch all this time. The top still looks exactly the same, so it’s held up well being exposed to the elements on my covered porch. I found all of the supplies I needed for the project at Home Depot. Here’s the link again to the tutorial, and it includes a link to the charred boards also. CLICK HERE. I had no idea you could buy already charred boards. What a time and temper saver. Your table looks amazing – not too plain and not too burned. So many of those I’ve seen done at home are too black and smoky looking. Thanks for posting. Pat I agree the boards were just right. I loved how the project turned out too. You’ve got to love anything on your porch that can stand up to the ever changing weather! Now, tell us about that cute little runner in your color of the year. Probably, your entire life! ? Ginger, you know me so well!!! 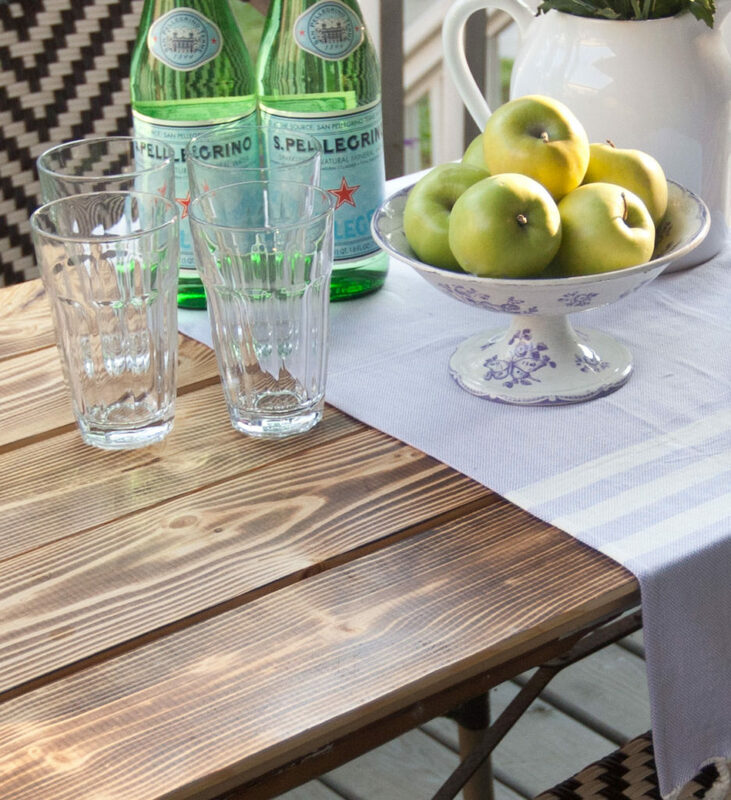 The table runner is a Turkish towel. I got this one from Turkish T.
Of course it is, and I should have realized that ever since you were in the tub with Fifi! (LOL, that outa raise an eyebrow somewhere) ? Hi! How do you deal with the crumbs and debris that fall in between the cracks? Do you just vacuum it out? Just curious as I would like to use this technique for a tabletop I would use every day in my kitchen. Thanks! Cheri, I would use a vacuum. This top is actually not attached to the tabletop, so I can tilt it and let the crumbs shake out. Love your table, love the table setting. Fab job! Thanks Ivory. We really like the look, and it was a fun project. I didn’t know you could by boards already charred! It looks great Anita! It was news to me too. I really like the wood grain in the boards. Love the look. What is the metal base &do you know how & where to get one? I agree with Suze. I LOVE THIS TABLE. I keep looking at that metal base and wonder what it is and where you got it. Thanks for posting it. I got it at Round Top at the antique show. I love Round Top Antique shows. I live in Austin but don’t get there as much as I would like. Love that table, Anita. Great job.